(Bloomberg) -- The number of U.S. airport screeners who took unscheduled absences rose to 10 percent on Sunday, more than triple that of a year ago as the stalemate over the government shutdown continued over a holiday weekend, according to the Transportation Security Administration. 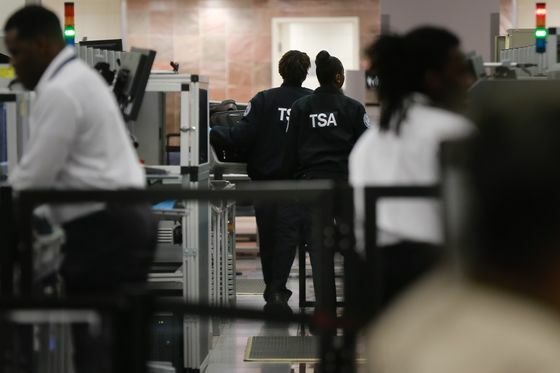 The number of unscheduled TSA absences hit the highest level seen so far, the TSA said in a statement Monday as the shutdown entered its 31st day. A year ago the absence rate was 3.1 percent. “Many employees are reporting that they are not able to report to work due to financial limitations,” according to the statement. Airport screeners are in a category of workers including FBI agents and border patrol officers who are considered “essential” and therefore required to work without pay during the shutdown. The worst delays on Sunday were reported at the main airport in New Orleans, the TSA reported, though it said 99.9 percent of passengers waited less than 30 minutes. The partial government shutdown that began Dec. 22 has halted funding for more than a dozen major departments and agencies. Yet there was little end in sight to the shutdown as Trump was locked in a political fight with congressional Democrats over funding to build barriers along the U.S. border with Mexico. The president said in a Jan. 19 speech he would support a mix of immigration-related proposals in exchange for $5.7 billion to build a wall or other barriers along the border. Although Trump said the Senate would soon bring up legislation containing the funding and proposals, Democrats rejected the plan. Democrats have called for the government to be reopened to allow workers to get paid while discussions over border security and the president’s wall continue.